Amber Crown Pet Supplies recently sent me an amber pet collar to try out with our dog, Venus, and share my results with you all. Below you will find a product description provided by the company, as well as how the product worked for me and my honest opinion of it. Amber Crown as a brand and trademark is proud to present highest quality handmade certified genuine Baltic Amber products directly from amber origin country Lithuania. How to protect your dog from ticks and fleas?You have two choices: chemicals or chemical free products. But what if you or your pet is allergic to chemicals? What about pregnant, nursing pets, puppies and kittens? Would you like to risk having chemical effects on your pet, kids or house? Definitely not. Amber collar for dogs and cats by Amber Crown is the verified natural tick and flea protection tool. Suitable for dogs and cats, even if they are allergic, pregnant or nursing. 100% chemical free, no insecticides. Safe for humans and animals, no secondary effects on your pet or family. 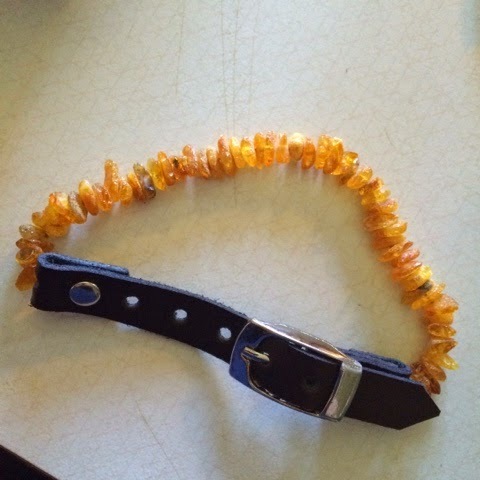 Powerful weapon against parasites and great looking pet adornment.Thousands of satisfied buyers are using our amber collars to protect their dogs. 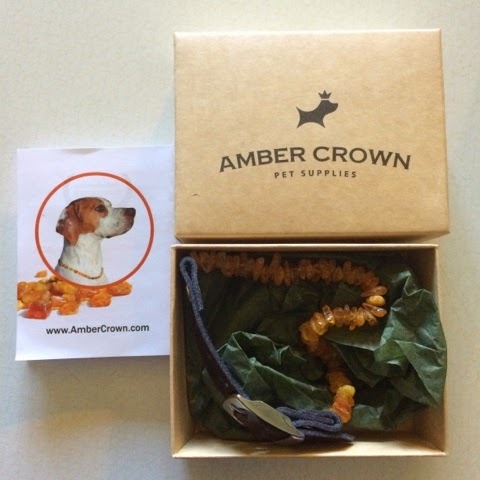 How does Dog amber collar work?Amber is natural tree resin fossilized in millions of years. It works in two ways:• When worn on pet the friction from their fur releases aromatic terpines from amber that repels ticks and fleas.• Static electricity generated when amber is rubbed against the pet's fur makes parasites uncomfortable and unable to cling to hairs.Remember, only unpolished amber collars protect against fleas and ticks! Amber beads are separated by knots in groups to prevent scattering. Each stone is unique, therefore, the actual color varies slightly from the image and the shape of beads varies naturally. - Proven natural defense against ticks and fleas for your dog. Handmade from 100 % the authentic Raw Baltic amber in Lithuania, country of amber origin.- 100% chemical free, non-toxic, no insecticides. Safe for humans and animals, no secondary effects on your pet, family or house.- Can be used for dogs and cats, puppies and kittens, even if they are allergic, pregnant or nursing. Waterproof, odor free and does not affect your pet's sense of smell. I feel like the amber flea and tick collar is good in theory, but for our dog it simply does not work. When tight enough to rub against her fur to create a scent (that I personally have never detected from anber) or to cause static that would be a deterrent - the Amber is too rough and uncomfortable for wear, and my dog tries to scratch the collar off. When I loosen it up, it's too dangly to be effective and can easily get caught on something and break. I know amber therapy is an effective pain treatment on people, but I think it would take a special type of pet to be able to tolerate something like this. You can find this product on Amazon.